Rossvale went out of the Scottish Junior Cup when they lost 3-0 to Pollok in their fourth round tie at Petershill Park on Saturday. But the Central First Division leaders didn’t let themselves down against the Super Premier League giants in front of a very healthy crowd. 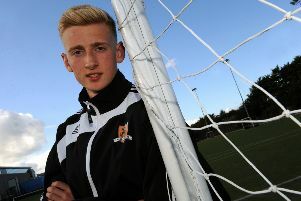 Pollok had two new faces in their team, 18-year-old goalkeeper Scott Johnson stepping up from their youth team due to injury and big signing from Clyde, David Gormley. Vale’s Liam Crichton was first to get a shot in on goal in eighth minute when his strike from about 25 yards narrowly went over, but Johnson had it covered. Shortly after Gary Giffin burst down the left and his cross into the box was met by the head of Liam McGonigle but he couldn’t control it and again Johnson was in place to save it. In the 22nd minute Giffin cut in, beating three defenders, and found McGonigle with his cross but his shot narrowly sneaked past the post. Stephen McGladrigan was next to have a pop at goal from 25 yards but saw it soar over the crossbar. Vale were well in the game at this stage but it was a very entertaining match for both sets of supporters with Pollok trying to get grip and it took Vale’s hardworking defence to keep out a very good Pollok move. The home side had another great chance when a throw-in from Gary McGrath found McGladrigan who then found Giffin and it took a good save from Johnson to keep it out. At the other end Gormley finally managed to hold off and turn his man to get in a shot from 20 yards but it sailed over the bar. Pollok’s Gary McCann then crossed to Stuart McCann whose shot was well saved by Donnelly. McGonigle again was deprived of a goal by Johnson after Giffin had another amazing run down the left. But Vale were dealt a crushing blow when Pollok took the lead with just 30 seconds of the half left. Gary McCann ran down the right wing and put over a fantastic cross to find a diving Stuart McCann who buried the ball past Donnelly into the corner of the net. Before most supporters were in their seats for the second half Pollok were two up. Again Gary McCann got the ball on the wing and crossed into the box for a waiting Stefan McCluskey to sidefoot into the corner of the net. This was big blow to the hard working Rossvale team but they kept trying and McGonigle saw Johnson again save his shot two minutes later. Captain Jamie Hunter saw a 30-yard drive go well wide of the goals, but Pollok were starting to step up their game and most of the play was going towards Donnelly’s goal. McCluskey took a free kick near the touchline 20 yards out and tried to catch Donnelly out at the near post but Donnelly was up for it and did well at second attempt to keep it out. Minutes later Gary McCann nearly got onto the scoresheet when a long clearance was misjudged by Matt Niven which allowed him through on goal but the brave Donnelly saved at his fee. However two minutes later McCann’s teasing ball into the Vale box found Derek Hepburn who easily turned the ball into the empty net to seal Pollok’s place in the next round. Even though they are several divisions apart this was a very entertaining game enjoyed by both set of fans and again won Rossvale Juniors more admirers in the game.